Throughout many research and development projects for active rule systems, active rules are implemented with different syntax and semantics. 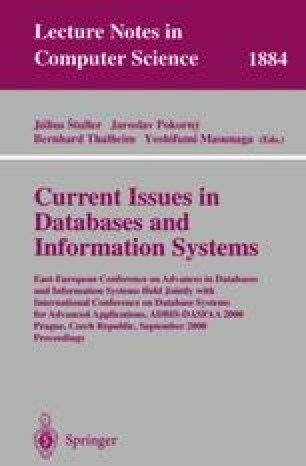 It becomes one of the stumbling blocks to apply active database systems especially in networked heterogeneous multidatabase environments. Utilizing the recent development of CORB A and ODMG standards, an active rule system is developed for heterogeneous ODBMS. Active rules represented in an ECA type are managed by a rule base. When events included in application database programs are detected, triggered rules by the events are retrieved from the rule base over network and interpreted dynamically. To ensure fast interpretations, the rules are stored in a bytecode format. Separation of rule-managing function will allow updating rules anytime without modifications in application programs or DBMS. The changes in rules will be reflected instantly in application programs via dynamic interpretation. The active rule system described is applied for integrity maintenance of spatial objects. With experimental results, overheads of byte code interpretation and runtime retrieval of triggered rules through network are discussed. This work is supported by Inha University in 1999.